Enabled by default. Can be disabled in the graphics driver. Frame rate is capped at 67 FPS. 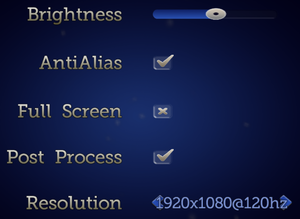 See High frame rate. Change borderlesswindow from false to true. Change framelimit from true to false. For 60 Hz users, disable vsync in the graphics driver. In Toyland Act 3, there's a bug where Mickey falls below the floor and gets stuck. Enable the frame limiter to prevent it from happening. 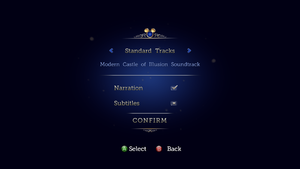 Achievements menu opens in Steam Overlay (⇧ Shift+Tab ↹). 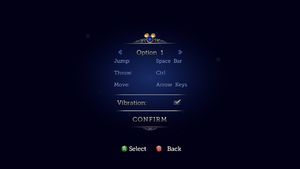 Button/key prompts will not switch over while the game is running. Verified up to 7.1 output. 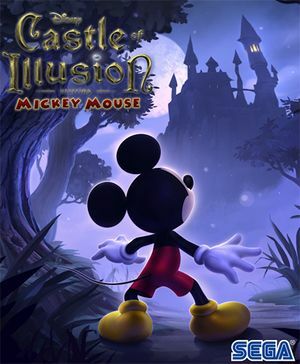 Use Helix Mod: Castle of Illusion. The following graphics cards are not supported on OS X: ATI Radeon X1xxx series, ATI Radeon HD2xxx series, Intel HD3000, Nvidia 7xxx series, Nvidia 8xxx series, Nvidia 9xxx series, Nvidia 3xx series and Nvidia 1xx series. ↑ 2.0 2.1 File/folder structure within this directory reflects the path(s) listed for Windows and/or Steam game data (use Wine regedit to access Windows registry paths). Games with Steam Cloud support may store data in ~/.steam/steam/userdata/<user-id>/227600/ in addition to or instead of this directory. The app ID (227600) may differ in some cases. Treat backslashes as forward slashes. See the glossary page for details. This page was last edited on 29 March 2019, at 00:44.